Willie H. Alls, Jr. has a lifetime of experience in Gospel Music. When he needed a way to share his expertise about the industry he came to Columbus Publishing Lab with his manuscript. We were able to facilitate Willie’s mission to help Columbus gospel artists by publishing his book, Making it to the Top in Gospel Music. 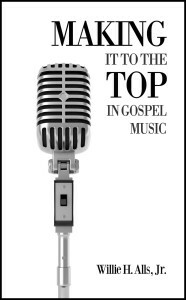 Making it to the Top in Gospel Music was published under our Proving Press imprint and is now available on Amazon.com, as well as all other major e-book markets. Find Making it to the Top in Gospel Music here. Willie chose The Isoptope Package, and added our standard cover design service to give his book the professional exterior he was looking for. The interior of Willie’s book was also expertly formatted. We made sure the text was not only readable, but ready for the printer and all major e-book markets. All of our packages include the assistance of a dedicated Lab Assistant. Instead of talking to voicemails and dealing with multiple people, Willie had a single point of contact he could rely on at any time. We’re here to make the self-publishing process easy and enjoyable for you.